Aside form appearing random, the brutal Woolwich attack this past week was one of the most bizarre and strangest of its kind yet. Many observers have already witnessed the heavily politicised, anti-government and ‘Islamic terrorist’ narrative which was immediately applied to the event by the corporate media. A friend of one of the suspected killers of a soldier butchered in a London street was arrested by counter-terrorism officers yesterday after going on television to allege that Michael Adebolajo was tortured in Kenya and harassed by MI5 – who asked him to spy for them. The Guardian understands that Nusaybah is connected to extremists formerly in the banned group al-Muhajiroun. Counter-terrorism officers turned up at reception at the BBC’s central London headquarters as his interview was being recorded an hour before it was broadcast. 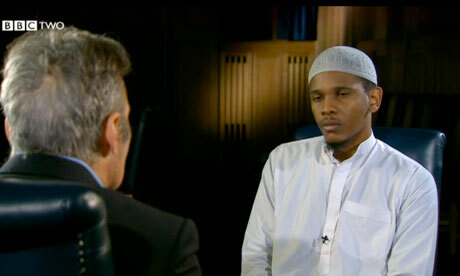 The officers waited, then arrested Nusaybah as he left the BBC’s headquarters.